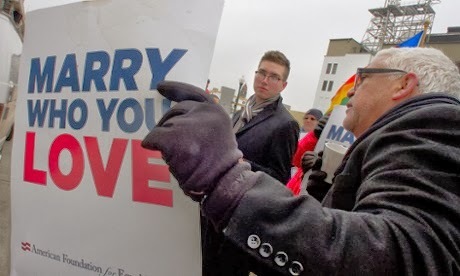 Kansas protesters have success rejecting a religious rights bill. Perhaps it was legislative overreach. But nothing compared to the potential impact of federal judges overturning democratic initiatives. Though this protester's placard represents sound advice, it is hardly definitive. I love my mom, I even live in her house. I also love my 1995 Toyota 4-Runner SUV. I love furry little kittens and bunny rabbits. I adore little children. But we don't really have any desire to marry. Honest. Maybe there's a bit more to this issue than the sound bytes and slogans can communicate. "Love" is much more than indulgence of the biological imperative. And marriage is a "gestalt" that means so much more than "I am physically attracted to you and want to share your bed for a while".